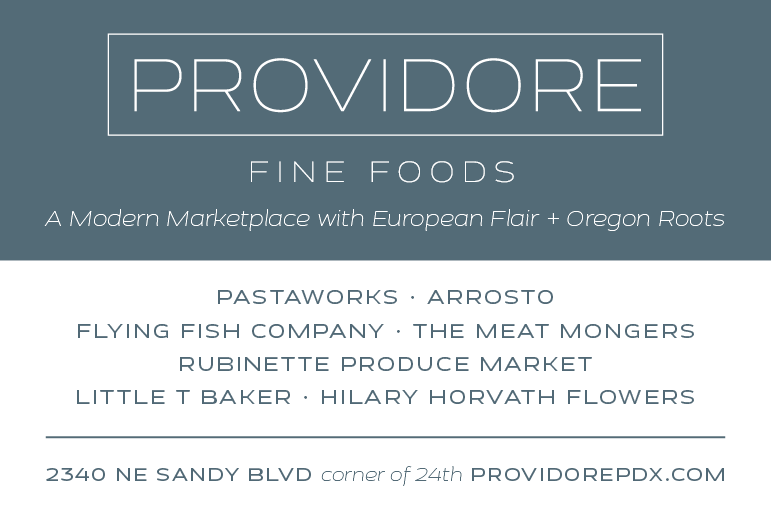 "Crop-Up" Dinners: Farm to Table Dinners for $20! 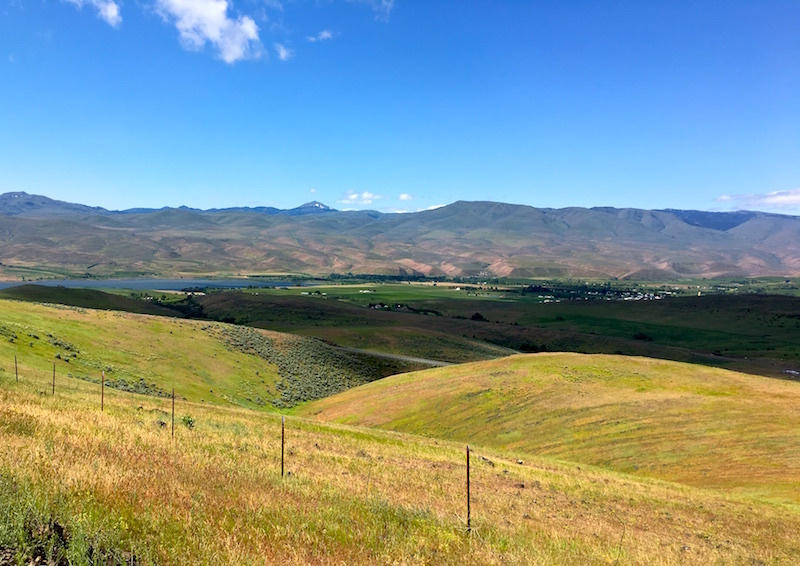 On a trip to Eastern Oregon for a food conference in May (read my report here), I decided to take a couple of days to explore this incredibly beautiful part of the state. You can read part one about the trip to La Grande and Union. 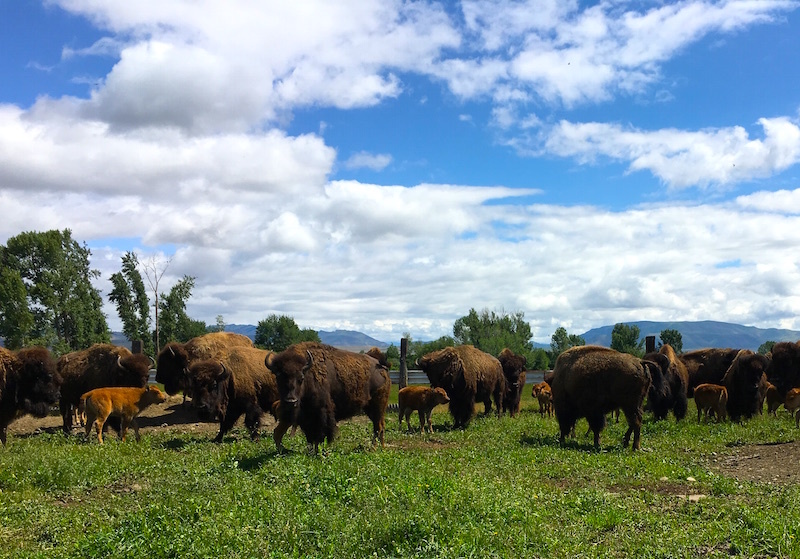 The portion below follows up with our adventures in Baker City and a tour of a buffalo ranch in Halfway. After a day spent sitting in a conference room, fascinating as the topic was, I was ready for a beer. Fortunately we were scheduled to spend the night in Baker City, home of the award-winning Barley Brown's brewery. 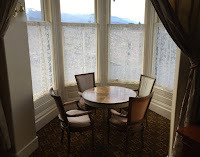 In addition, we must have been due some karma points, since, on our arrival at the Geiser Grand Hotel, we were escorted to a corner room on the second floor with a stunning panorama of the aptly named Blue Mountains. A sitting room with a view. The historic landmark hotel, built in the Italianate style popular during the Victorian age, first opened in 1889 and remained in continuous operation until 1968. Threatened with demolition in the early 1980s, it was bought by preservationist and developer Barbara Sidway and her husband, who spent several million dollars restoring the grande dame which now dominates the quaint downtown. 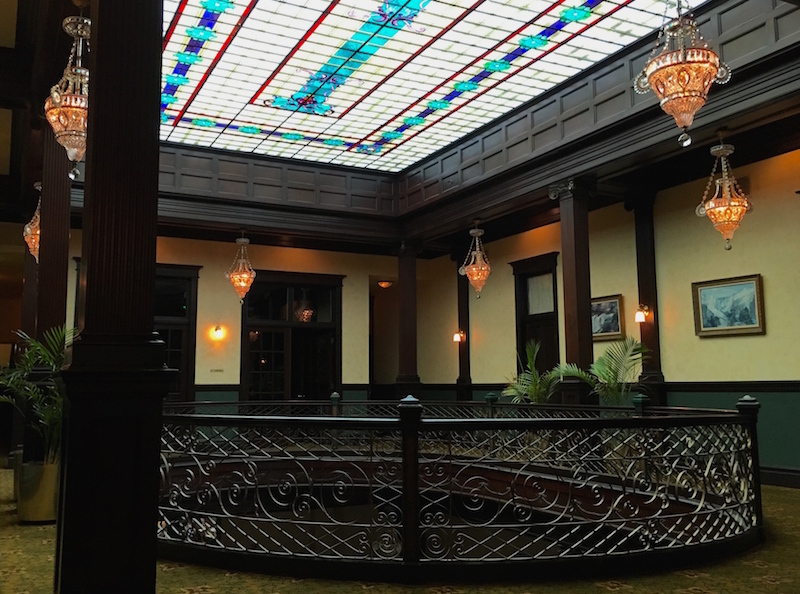 From the gleaming woodwork to the filigreed railings and period chandeliers under the huge stained glass ceiling on the second floor mezzanine, it's clear this restoration was a labor of love. Fermented libations at Barley Brown's. 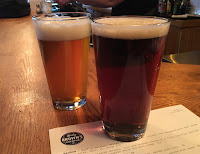 After settling into our room, we strolled a block down the main street and took a seat at Barley Brown's bar, trying to decide on the type of beer we were in the mood for—mild, wheat, flavor, hoppy and bold are the categories listed. It's a small place by Portland brewpub standards, but features a wide-ranging menu from standard pub grub to a 10-ounce flat iron or 12-ounce ribeye. And from what we saw coming out of the kitchen, it all looked mighty tasty. There was plenty of time before our dinner reservation at the hotel's restaurant that evening, so a snooze seemed like just the ticket to follow our pints. 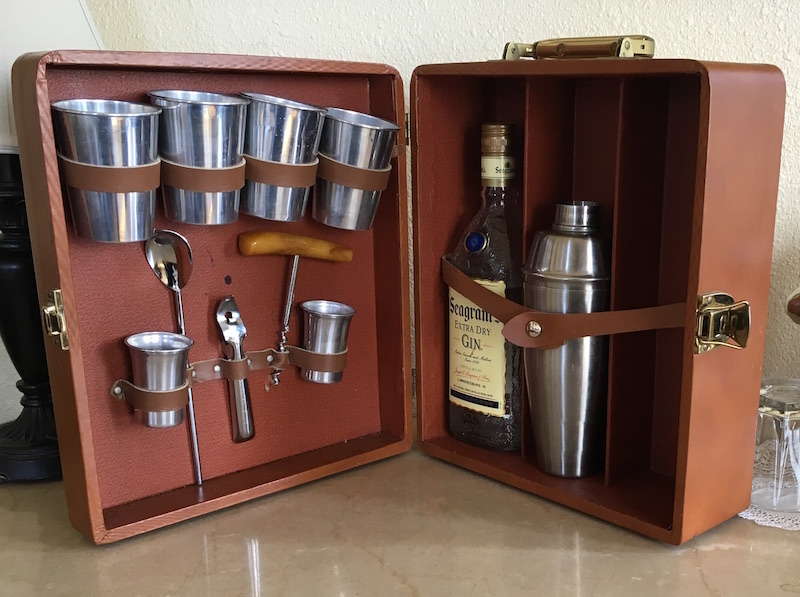 After waking up an hour later—and wondering why we don't do this at home more often—Dave reminded me that we'd brought our travel bar with all the fixings for martinis. A civilized cocktail in our elegantly appointed room before sashaying downstairs for dinner? Done! Overlooking the Brownlee Reservoir and Richland, Oregon. In conversations before we arrived, Sidway told me that once restoration of the hotel was completed in 1993, she felt the natural next step was to focus on featuring local food on the restaurant's menu. As I had found out at the conference earlier that day, being surrounded by cattle ranches, farms and fields of grain does not a local food system make. Most of the beef and grain was shipped out of the region to supply the commodity market, and the food available in local grocery stores was arriving from destinations hundreds, if not thousands, of miles away. Buffalo mothers and calves near Halfway. Since that time a few local ranches have started supplying the area with pasture-raised beef, pork and lamb, and Sidway has found small-scale farmers to supply vegetables for the kitchen during the summer months. As a result of meeting local producers for her restaurant, she also became active in promoting agritourism in the area. An outgrowth of those efforts is that hotel guests wanting to learn more about the economic and cultural importance of ranching to the region can now choose from a curated selection of Ranch Experiences. 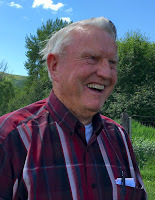 Dave Dur, rancher, Halfway, Oregon. 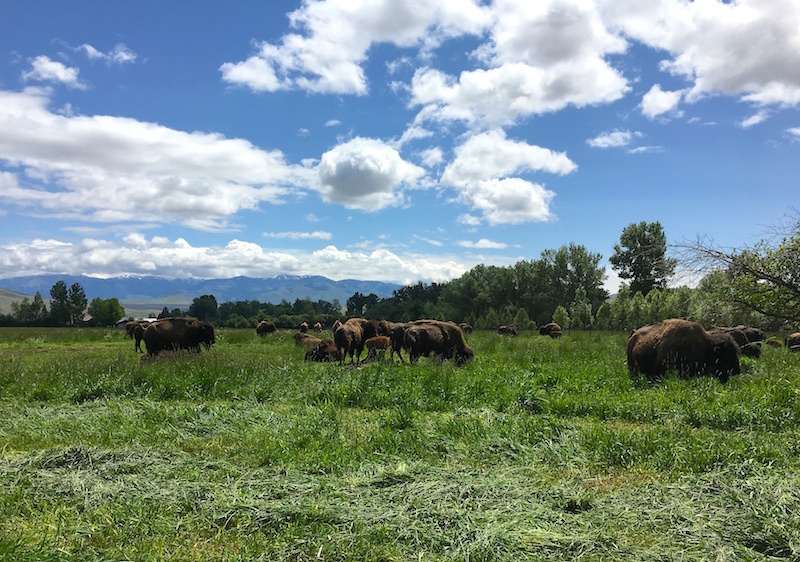 One of Sidway's ranchers is Dave Dur, who supplies the hotel's restaurant with buffalo meat from the herd of 250 animals he raises on pasture in Halfway, Oregon, a little more than 50 miles from Baker City. Tucked in the foothills of the Wallowa Mountains, he (and his buffalo) also have a view of the Seven Devils Mountains on the other side of the Snake River in Idaho. On the day we visited in late May, the alfalfa on Dur's ranch was nearly ready to harvest and the foothills were so green it looked more like Ireland than the dry brown landscape I expected to see in that part of the state. 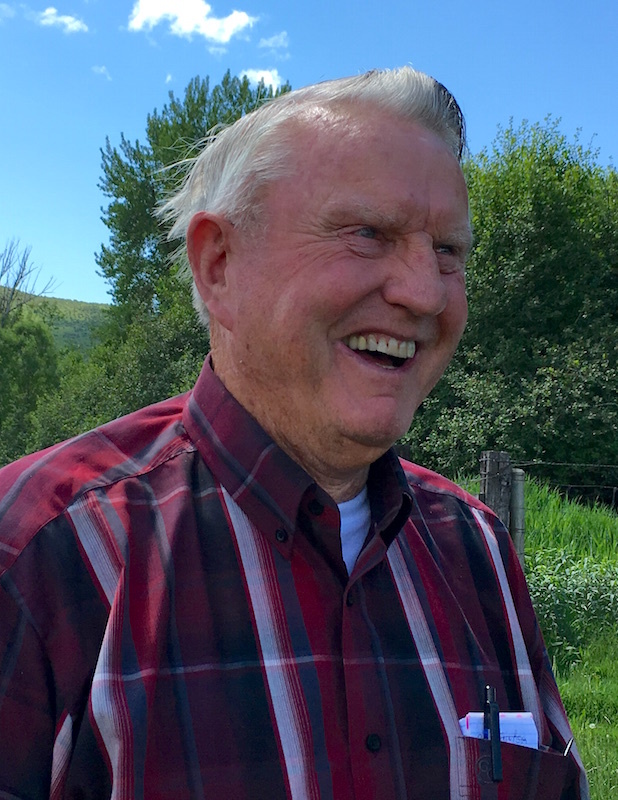 Originally from Pennsylvania, Dur owned an electrical business in Corvallis until he decided to buy the ranch in Halfway, though the buffalo only came along after he'd failed to make a go of sheep, grain, hay and cattle. A neighbor told Dur that he wanted to go back to Alaska, offering to sell him 12 buffalo for a good price. The animals turned out to be perfectly suited to grazing in his pastures. "These animals took care of themselves for millions of years," he said. "They don't need me to take care of them." Buffalo on pasture in Halfway. Tall, with a shock of white hair, crystalline blue eyes and a booming laugh, Dur has the courtly manners of a bygone era but isn't above making blunt observations. On a tour of the ranch, he also likes to shake up his city slicker guests by chasing some of bulls across the rutted pasture in his old Chrysler sedan. "Murdered by his pretended friends." After the merry chase, Dur took us to a spot in one pasture where there an iron cage surrounding a white marble monument (the better to protect it from buffalo that felt it was ideal for rubbing their horns on). 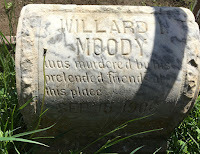 It marks the spot where, as it states in flowing script, "Willard I. Moody was murdered by his pretended friends on this spot. Sep. 15, 1906." 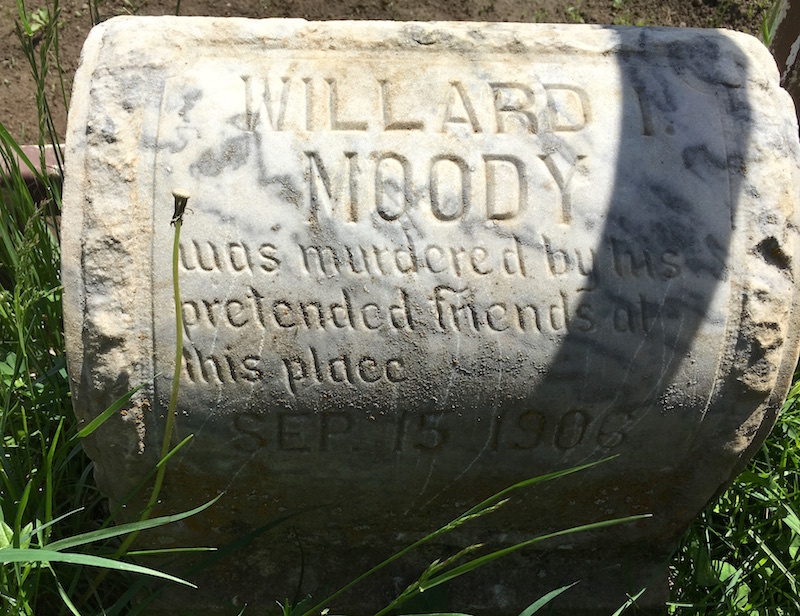 Dur said the story goes that Moody was killed in a disagreement over a woman, and that the memorial was placed there by Moody's father, with a similar marker on Willard's grave in the Halfway cemetery. Read part one of this series about La Grande and Union. You can also read my report on the rural food system conference I attended.